Taormina/Italy, July 2016: The memorable location of Taormina Greek Theatre hosted the first edition of the Graduation Day during which the University of Messina conferred bachelor, master and PhD degrees to graduating students. University of Messina celebrates the first edition of the Graduation Day in the memorable location of Taormina Greek Theatre. 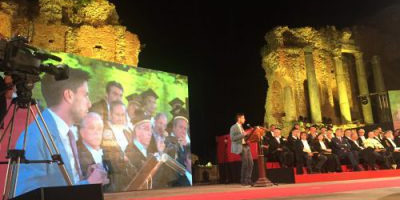 More than four thousand people, including graduating students, families, professors and all the academic staff, have attended on July 26th, the first edition of the Graduation Day organized by University of Messina in the extraordinary location of the Ancient Greek Theatre of Taormina. The event, opened with the Gaudeamus Igitur intoned by the University Choir, has celebrated the success of the young graduates that with perseverance, commitment and enjoyment have achieved a significant milestone in their cultural and professional growth. Expressing happiness ahead of the Graduation Day, the Rectur Magnificus, Professor Pietro Navarra congratulated the students in his opening speech, saying: “Today is an important time in your life, a monumental accomplishment in your careers and a proud moment for your parents and families. Today also marks a transition from one period to another one of your lifecycle.” Thus, looking forward to the future, the Rectur Magnifucus encouraged the young graduates to follow their dreams and passions with audacity as well as to face challenges and opportunities with onesty and integrity always believing in their self and in their own talents. A number of distinguished guests have joined the Graduation Ceremony: Ambassador Francesco Paolo Fulci, the Physicist Michele Parrinello and the entrepreneur Santo Versace have offered their congratulations and wishes to the graduates. Simone Massaro, BaxEnergy CEO, during his speech at the Graduation Day of University of Messina. As testimonial of a successful story, Simone Massaro, CEO of BaxEnergy, has attended the event sharing with the graduating students his professional experience, built on a strong desire to learn and to know new things. In his speech, Simone Massaro has remarked the importance of being part of a globalised and interconnected World where distances do not exist anymore and it is possible to work and communicate from one side of the World to the other. “Living in a global society requires a greater effort. Today to make the difference is necessary to speak more than one language, to have an open-mind and to use your wits”, said Simone Massaro. He continued putting the emphasis on three key elements that should enrich the long journey of everyone’s life: enthusiasm, energy and determination. These were the three driving factors that pushed Simone Massaro not only to discover the World but also to come back in Italy from the United States to found the BaxEnergy. Today, the R&D Center of BaxEnergy counts more than seventy engineers that work on projects realised all over the World: from Europe to Africa, from America to India. Lastly, Simone Massaro has concluded his speech with a special wish addressed to the students: “In this important day, often known as the Commencement Day, my wish for you is to discover the World, find your paths and make your own history”. The Graduation Ceremony ended with all graduates marching to pick-up their degrees and throwing their mortarboards into the air as a sign of rejoicing over their success. Watch the whole speech of Simone Massaro, BaxEnergy CEO, on our Youtube channel.